Every newly created blog has the same default lay out with posts displayed on its front page (‘Home’) with a ‘Hello World’ post and an ‘Sample’ page. Refer to the differences between pages and posts to learn more. The About page. Your About Page is used for telling readers more about yourself and your blog. Contact page (here’s how to create a Contact page). Pages are best suited for information you rarely update such as your About, Contact and Blogging Guidelines pages. Situations where you want students to discuss a question or topic are better suited to publish as a post and not a page. 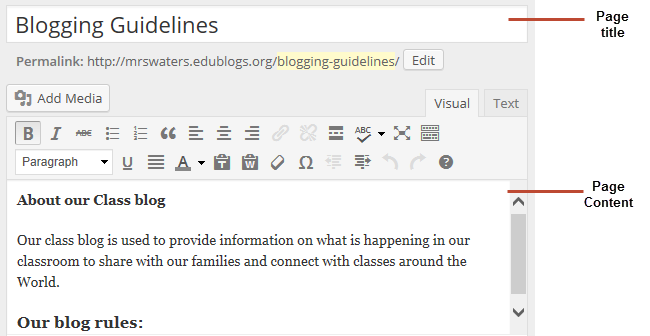 Comments – most Edublogs themes support comments at the bottom of the page. 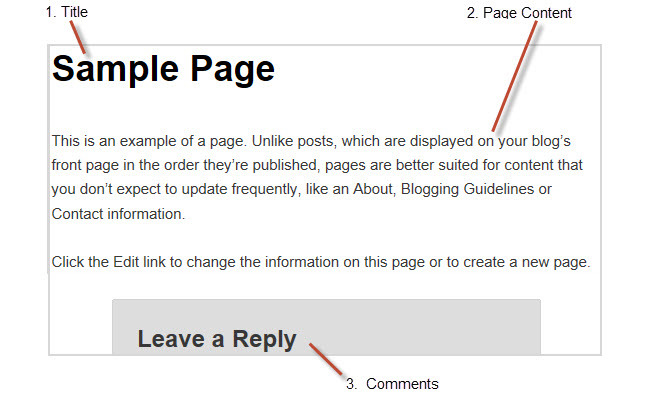 This allows your readers to add a comment to your page. There are situations where you don’t want comments on pages. Here is how to disable comments on pages. You can preview your page before publishing by following these instructions. See the publishing new pages support page for more details. If you would like to edit an existing page, go to Pages > All Pages and click on the Edit link under the page title you want to edit. See the editing pages support page for more details. We’re often asked if it is possible to add posts to other pages, rather than just the front page of the blog. This is commonly asked by educators who want to use one blog for multiple classes or subjects. Yes you can! But it does involve slightly advanced blogging skills. You do it by sending posts to different pages on your blog by assigning different categories to posts, based on the class or subject, and using a custom menu to create link to the categories from your top navigation. When students and parents click on their category they’re taken to all the posts for that class or subject.